We are so proud of the great work our team does for our clients and in their communities. 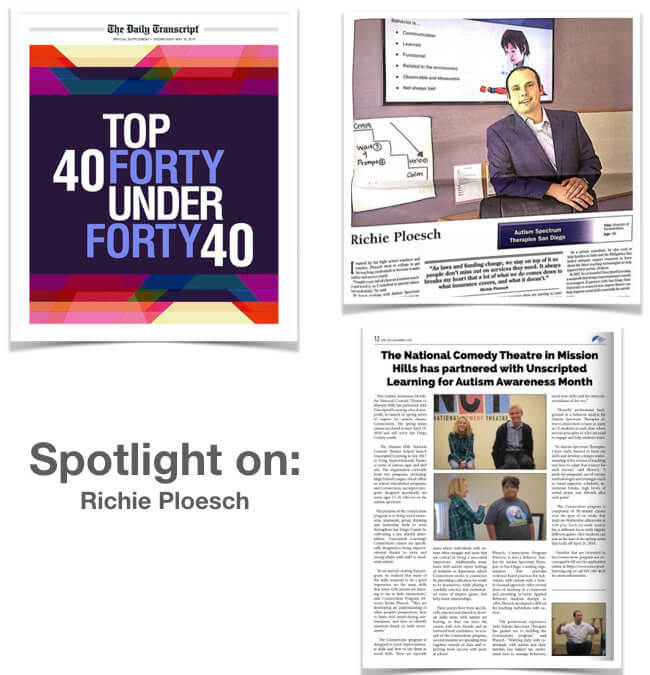 Richie Ploesch, Director of Partnerships has been recognized by the Daily Transcript as one of their Top Forty Under Forty and we couldn’t agree more. Along with his tremendous work for AST, Richie is the Program Director for Connections an improvisational program designed for teens on the spectrum. Connections was recently featured in several SD publications for their great work. Richie Ploesch, M.A., BCBA has been working in the field of special education for over 10 years. His specialty is educating students and young adults with Autism Spectrum Disorder. He earned his teaching credential in 2006, a Masters Degree in 2008, and became a Board Certified Behavior Analyst in 2009.